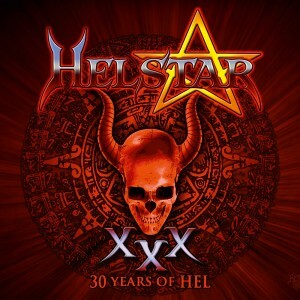 It’s only taken Helstar 30 years to get around to their first officially sanctioned live album. Even taking into account a hiatus in the 90s, that’s a long time. Helstar is basically defined by James Rivera’s voice. James has been very much in demand, offering his characteristic voice (and off pitch squeals) to a variety of bands. Nowhere does he sound at home like he does in his own band though. Helstar has always stood for solid American heavy metal. There’s the usual Priest and Maiden influences but Helstar have always managed to put their own stamp on their sound. The material sounds quite live and undoctored. There’s the odd bum note or sloppy break to further prove we’re not just listening to the studio versions with added applause. The song selection covers all of Helstar’s discography. If you’re still craving more metal after this 2CD/DVD live set, you can rightfully claim to be a metalhead. The band is tight, the setlist is as varied as one can expect and production is raw and in your face. Add the DVD and this becomes a very tempting package for both fans and people curious about Helstar. This entry was posted in Reviews and tagged 30 years of hel, AFM Records, Helstar, James Rivera, review. Bookmark the permalink. India is developing a thriving underground metal scene. Amongst the better bands there’s up and comers Bevar Sea who ply their doomy trade and are definitely a name to watch. Kryptos is an established name in the scene. They sail a more traditional old school heavy metal course and do so remarkably well. Influences range from NWOBHM (Iron Maiden in particular) over thrash to the occasional hint of Celtic Frost, especially in the gruff vocals. Epic at times, melodic at others and always heavy, Kryptos is a very pleasant discovery. Check the groovy “Serpent Mage”, album opener “The Mask Of Anubis” or “Starfall” to get an idea of what this band stands for. Kryptos offers what a lot of European bands lack : attitude. Metal isn’t about wearing the right T-shirt, it’s about the riff, about the music. Production is simple but effective. Every instrument sits well in the mix. Lead guitarist Rohit Chaturvedi is rather openly influenced by Dave Murray, which can only be a good thing. Don’t expect high pitched squealy vocals. This is no girly power metal. The vocals are where the thrash influences are most obvious. An excellent album. I’m looking forward to hearing more music from that part of the world. This entry was posted in Reviews and tagged kryptos, review, the coils of apollyon. Bookmark the permalink. 18th studio album from legendary British pomp (anyone remember that term?) 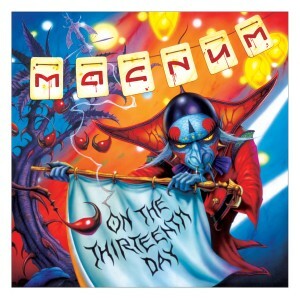 rockers Magnum who appear to be undergoing something of a renaissance in recent years. Having been a fan since their commercial peak of “Wings of Heaven” and “Goodnight LA” I must admit to have been somewhat disappointed in the majority of their releases post their reformation in 2001 after a split of six years, so it’s with some trepidation that I listen to another album. Whilst it’s been apparent that Bob Catley’s voice isn’t what it was 20 years ago for the last few releases, main writer Tony Clarkin appears to be writing with this in mind, giving us lower keys, and whilst Catley may not have the golden quality of yesteryear, he can still belt out a tune with passion and sincerity, the man is also a joy to behold live. Speaking of Clarkin, the man seems to have rediscovered the urge to write more driving, and pomp/progressive tunes than those heard of late. “Blood Red Laughter” being a strong case in point with a glorious pre-chorus where guitar and Mark Stanway’s keyboards merge nicely, not to mention the majestic title track which almost makes “On A Storyteller’s Night’ levels of quality! “Didn’t Like You Anyway” serves up Queen style pomp with a canny dark commercial punch before “So Let It Rain” aims for the top 40 with its modern viability and orchestrated edge. “Dance Of The Black Tattoo” might be the heaviest thing the band have recorded in some time, and gotta say it’s a nice addition to the Magnum sound, great chorus here as well, before the major tonality of “Shadow Town” lightens the mood, yet still drives at a fair pace. The album slows for the quasi power-balladry of “Putting Things In Place” and here Catley’s vocals are as soulful as you’d hope for. “Broken Promises” is somewhat of a mixed bag, starting out relatively bland which continues for the verses, yet gains life for the bridge and chorus where the band are firing on all cylinders, Thunder drummer Harry James is a welcome addition to the band with his uncomplicated style suiting the band nicely. “See How They Fall” is another pomp fuelled rocker, almost like the love child of the bands own “Kingdom Of Madness” with Dave Gilmour’s echo fetish, yet once again the band sound fired up and it’s a highlight to these ears and also appears to have brought the best performance of the album out of Catley. “From Within” by contrast sees the album out in mid-tempo waters, nothing overly poor here but nothing to end the album on anything other than an average listen. Overall this is easily the best release I have heard from the band since “Goodnight LA” and to be fair in a number of places can hang with the bands work from any era of their career. Production is solid, artwork looks good and the overall performances are strong, granted I have made some comments regarding the vocals but then not many singers had the pipes of Catley in his youthful prime and he’s not lost as much as say Coverdale has. Magnum fans don’t hesitate to pick this up, for the uninitiated this is a strong starting point before checking out essential earlier albums ala ‘On A Storytellers Night’. This entry was posted in Reviews and tagged Bob Catley, Harry James, Magnum, Mark Stanway, On The 13th Day, review, Tony Clarkin. Bookmark the permalink. 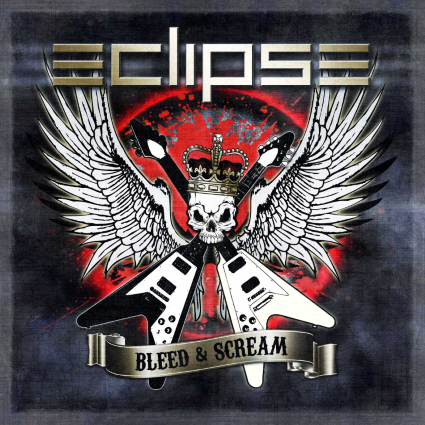 Eclipse’s debut album “Are You Ready To Rock” was a joyous mix of melody, guitars and fun. On the follow-up “Bleed And Scream” they seem to have matured a bit. No need for panic, they haven’t gone all Lynch Mob on us and replaced tempo and shreddy guitars with plodding grooves. No sir! Fast paced tracks with plenty of guitar breaks are still the order of the day. But overall the songs seem a bit more balanced, more polished. If you like melodic hard rock with a metallic edge, look no further. It’s impossible to designate stand out tracks, as the overall level is consistently high. These guys don’t seem to get a lot of attention (a decent website would probably help), but they are easily one of the best European melodic hard rock bands out there. 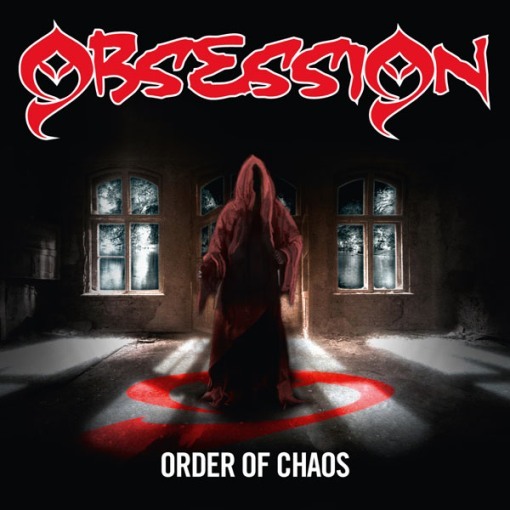 This entry was posted in Reviews and tagged Bleed & Scream, Eclipse, Frontiers Records, review. Bookmark the permalink. 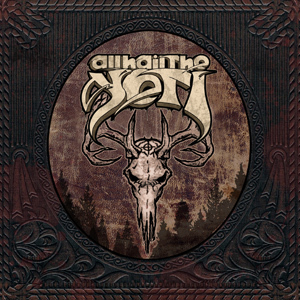 All Hail The Yeti are based in Los Angeles, but you’d be forgiven for thinking they’re a Louisiana or Texas band. Pantera were obviously a big influence on these guys, except for the distinct lack of lead guitars… Sludgy, groovy riffs coupled to angry vocals, yet with enough melody to sweeten the deal. The band takes some hints from the current wave of American metal bands like Lamb Of God as well. There’s even some MOD in there. Solidly executed but not always as inspired as you’d hope. There’s the obligatory film samples to help create the mood in a couple of places. And what’s with the 15 minutes of swamp sounds closing the album?? One word review : mediocre. This entry was posted in Reviews and tagged alll hail the yeti, review. Bookmark the permalink.